Mega Sale! Save 23% on the Moen TR1000OWB Tension Rod, Old World Bronze by Moen at Verso Laquila. SKU: 400466. MPN: TR1000OWB. Hurry! Limited time offer. Offer valid only while supplies last. 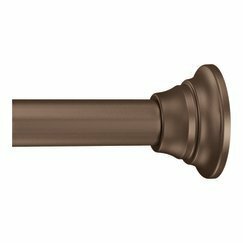 TR1000OWB Finish: Old World Bronze Features: -Shower rod. -Lightly brushed warm grey metallic look. -Highly reflective cool grey metallic look. TR1000OWB Finish: Old World Bronze Features: -Shower rod. -Lightly brushed warm grey metallic look. -Highly reflective cool grey metallic look. Product Type: -Shower Rods. Color: -Bronze; Chrome; Nickel. Material: -Metal. Dimensions: Overall Height - Top to Bottom: -2.52". Overall Width - Side to Side: -72". Overall Depth - Front to Back: -2.52". Overall Product Weight: -3.38 lbs.